I always enjoy looking for sea beans when I am walking on the beach. What are sea beans? This name is used for a group of seeds that float in water. Many of the plants that produce these seeds grow in tropical or sub-tropical areas. Many grow near rivers or coastlines. When the seeds fall from the plants, they can be washed into the ocean. Depending on wind and ocean currents, the seeds can remain in the sea for only a few days or for up to several years. When they wash up on beaches, they are often overlooked, but sea bean collectors consider them to be treasures! Why do sea beans float? Many sea beans have hard coatings and can look like smooth rocks. However, these seeds generally have an air pocket inside them which makes them buoyant. Other sea beans have corky outer layers. What do people do with sea beans? Some people just collect sea beans for the sake of collecting them. Many of the harder sea beans can be polished and turned into jewelry or used as decorative items. Some people like to try and grow the sea beans. It’s a good idea to learn what type of plant the seed came from before attempting to grow it. Some sea beans are seeds from fairly aggressive vines. What types of sea beans can we find in northeast Florida? 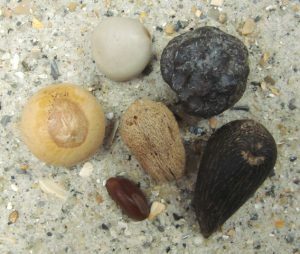 Clockwise from top–nickarnut, candlenut, starnut palm, hogplum, bay bean, laurelwood. One of the interesting things about sea beans is that many of the different types can be found all around the Atlantic Ocean and Gulf of Mexico. Hamburger beans and sea hearts are two of the most easily-recognized. 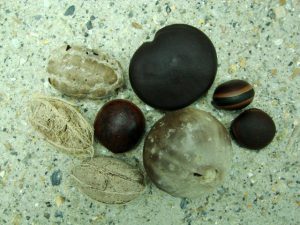 The starnut palm seed is often a favorite of collectors. All three of these can be polished. Tropical almonds are common—these grow in South Florida. Sea coconuts, or golf ball beans, are also quite abundant. Nickarnuts (also called sea pearls) grow in coastal areas as far north as Volusia County. Bay beans and moonflower seeds can come from local (Flagler County) beach plants. When collecting sea beans, it is a good idea to leave most of the ones from local plants on the beach. This will allow those plants to continue to exist and serve their important roles of trapping sand and providing food/shelter for beach inhabitants. How can I learn more about sea beans? The website www.seabean.com is a wonderful resource. There are links on the site to books on sea beans, how to polish sea beans and how to grow sea beans. There is also an online sea bean ID guide.